First I want to thank the authors for writing the amazing OCP study guide. 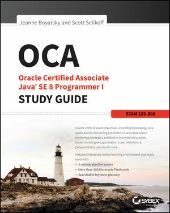 As this book helped me pass my OCP exam, it's an absolute honor to help others by adding a few errata. I apologize in advance if these have been posted before. Note: These pages refer to the electronic version of this book. BasicFileAttributes, DosFileAttibutes, PosixAttributes and their respective view-classes are not classes but are interfaces. One must assume import statements are correct when the code does not explicitly start from line 1. This question does start from line 1, thus it's lacking the necessary import statements. This code will not compile starting at line 1 instead of line 4 (answer at page 568). Thank you once more for this amazing book, I couldn't have passed this exam so quickly if it weren't for you guys. Welcome to CodeRanch and congratulations on the pass! I've confirmed both errata and will add them to the webpage tomorrow. Updated the errata list. Thanks Melvin! Something must have gone wrong though. I noticed that the import issue was added twice and the the Attributes are not in there.